Thank you for your interest in this Podio Tutorial that I put together. I did my best to break down this process into step-by-step instructions. 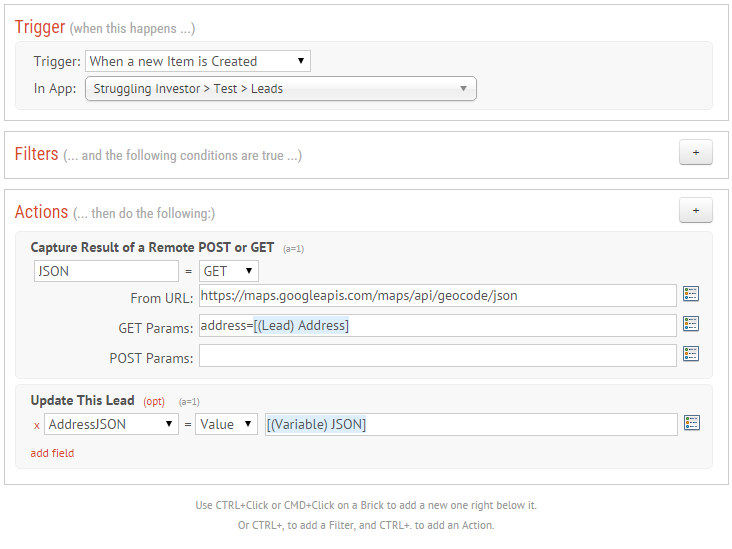 By following this tutorial you should gain an understanding on how to use GlobiFlow to make a Google MAPS API call to get back Address information. This tutorial will show you how to use Podio, GlobiFlow and the Google Maps API to obtain the full address information of a property. This address information includes Formatted Address,Street Number, Street Name, Neighborhood, City, County, State, Country, Postal Code, Postal Code Suffix, Longitude and Latitude. Why did I create the process? This procedure was necessary for my business because I need to have the County and Zip Code for every address. Sellers who submit their property info through my website fail to include these bits of information (mainly the County). The County information is used to help me redirect the lead to a partner who works in that area. While I could add a form field for County and make it required on my website forms, doing so just ads additional questions which turns many sellers off. The less fields the better. How Difficult is this to do? I feel that setting up this process is fairly straight forward because I’ve done the hard work for you. 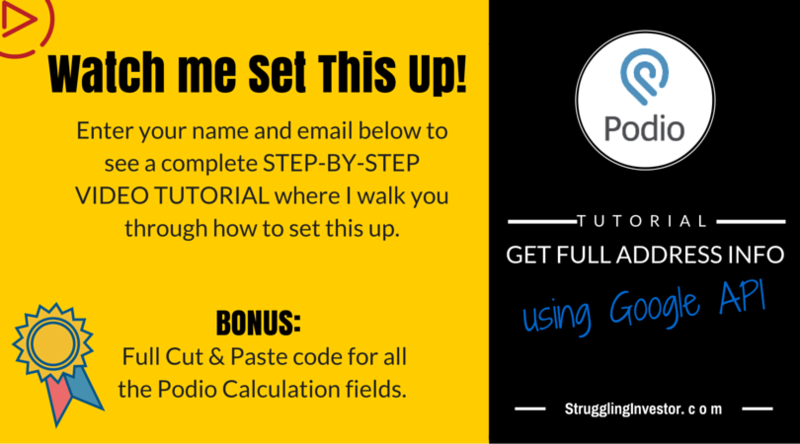 The Podio Calculation field code is the challenge here, but since I provided the code for you all you’ll have to do is cut and paste that part. Basically this process consists of adding 13 fields to a Podio App and creating a Globiflow process that has 2 Actions…fairly simple. The difficulty is understanding exactly what is going on and doing something you’ve probably never done before. Follow this tutorial from Module 1 to 4. Each module builds upon the last one so if you skip ahead the process most likely won’t work. While the Podio Location field is pretty slick, it fails to give me all the address information I need to run my business. Mainly what I need is the County and Zip information for a property. I use this info to pull in partners and buyers for my properties. This tutorial is a 3 step process where I show you how to use the Google Maps Api to get the full address information for all your properties. Google offers this API service for free as long as you don’t abuse it. In total there are about 13 fields you’ll need to add to (have in) Podio to make this process work. This first Module will go over 2 of those fields. Here I talk you through what Actions you need to call the Google Maps API and then return that information to the Podio App field. Because the Google Maps API returns the address information in what is called JSON format, we will need to use Podio Calculation fields to Parse out the address parts. In this video I will show you the end result of what you can expect by following this tutorial. The first thing we need to do is make sure we have the correct fields in Podio. Usually you’ll want to create this procedure in your main leads app. What we will be doing is adding 2 fields. One field will be for the lead’s address that we will send to Google. The other field will be to store the information we get back from Google. AddressJSON Text Multi-Line This field will hold the result of the Google API Call. I called it AddressJSON because JSON is the format that Google sends the information back in. In this video I will setup a brand new Podio app with the above fields. If you already have an Address field then feel free to use that. You don’t have to add another one. In this module you will go into GlobiFlow and create the process to pull in the address from Podio Leads App. Then you will call up google and send them that information. Finally Google will send back the full address information that we are looking for. We will take that information and place it back into Podio. Here is a breakdown of what goes into the GlobiFlow Process Flow that you will create in this module. The video will walk you through the steps. 1 When a new Lead Item is Created Every time a new lead gets created this flow will fire off. Doesn’t matter if you create the lead manually or from the import of your leads, this will run. – No Filter we want this process to run everytime we get a new lead. 1 Capture Result of a Remote POST or GET. This is a Remote POST or GET Action item. The idea here is that we make a call to the Google API Url and pass it the Lead’s Address. Google will return the information that we will store in the AddressJSON variable. To me this process is awesome because it pulls in information about a property directly from Google Maps. I always hated having to do a Google Search myself just to find a Zip code or the County information. This saves me hours each month. What this process also did was increase my knowledge and understanding about what can be done in Podio and GlobiFlow. Just think about all the other APIs out there that we might be able to leverage now that we know how to do it.